Although I’ve made many tinctures over the years, this is my first try with white willow bark. I’m curious to see how it will work for easing pains—headaches, menstrual cramps, joint pain, etc. Typically, I use an 80 proof vodka with dried herbs but read that with a root or bark, 100 proof might be a better solvent. I also keep a record (visible in the picture) of any herbal preparations I make in order to be able to exactly duplicate a recipe if I choose, or to alter it. This also allows me to keep track of the cost of my preparations. The first step was to fill a quart jar about 1/3 full of white willow bark and then to weigh it (3oz). Returning the herb to the jar, I then poured 100 proof vodka over it to fill the jar, measuring how many ounces I used (29oz). 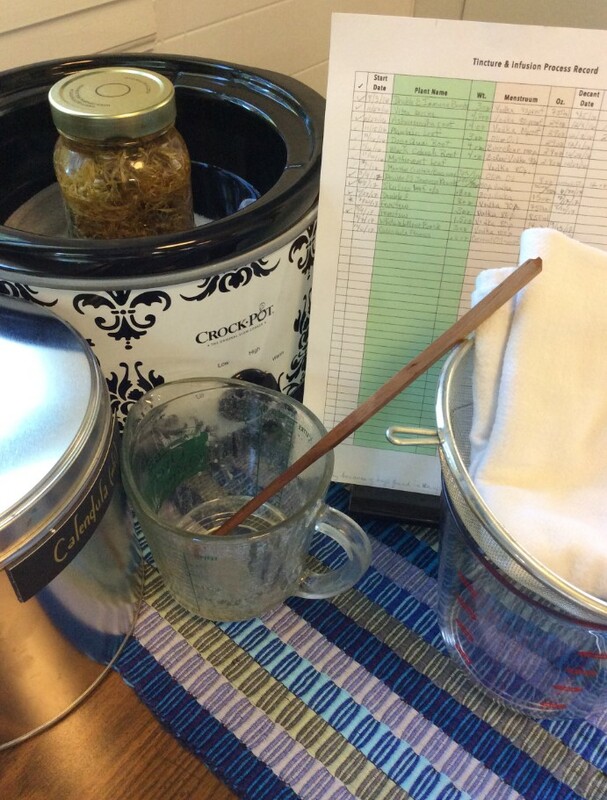 Then I labeled the jar with the name of the herb, the menstruum, the start date, and a decant date of 6 weeks later. Lastly, I placed the jar in a pie-safe away from light and shook it most every day. This a picture of a white willow bark tincture that I made. This will be ready to filter and decant on October 19, 2017.